A few months ago, I saw a pin of a map turned into magnets, and thought it was a pretty nifty idea, especially in our geography-deprived country. 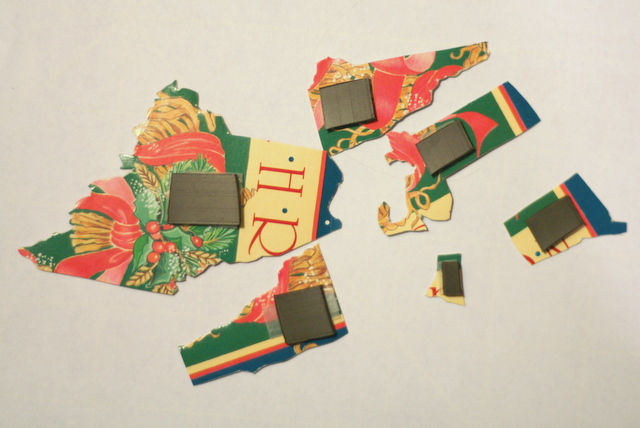 However, after reading the article about this project, I realized that the map in question started out as a puzzle, which while surely making the magnet-making-process a lot easier, didn’t help a whole lot for me, since I didn’t happen to have a map-shaped puzzle on hand. 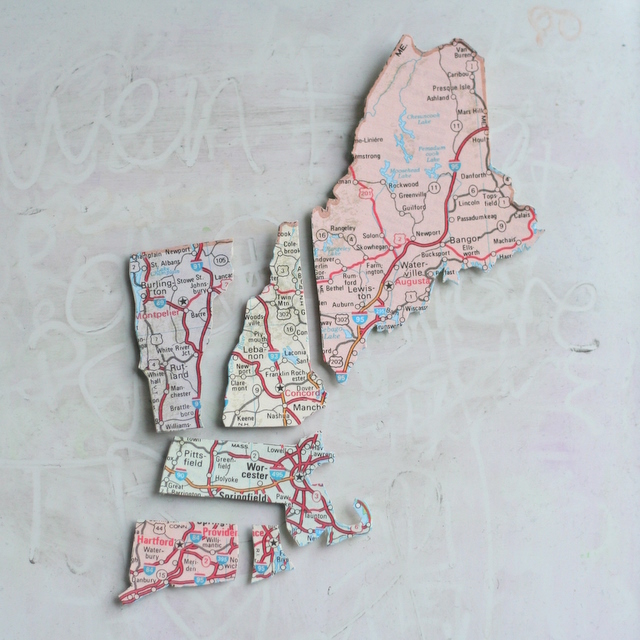 A map – a US map or world map works well, as long as there are individual entities within the map with defined boundaries to define your pieces. If you’re a AAA member, you can get free maps from them. 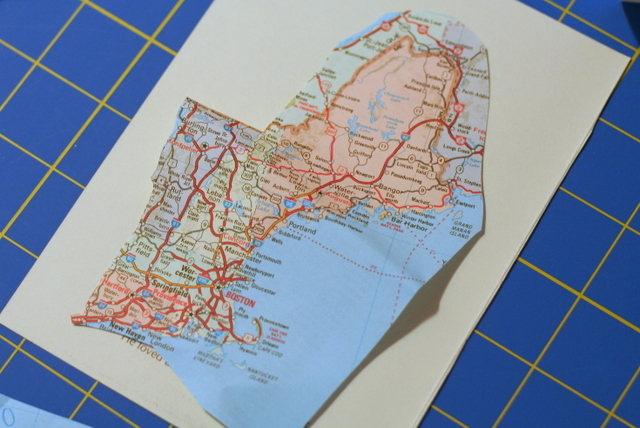 Spread a very thin layer of Mod Podge on the non-shiny side of the card (it should barely be wet) and carefully smooth the map piece onto the Mod Podge, rubbing out any wrinkles with your fingers. If it looks like it’s curling up, place under a book for a few minutes while it dries. 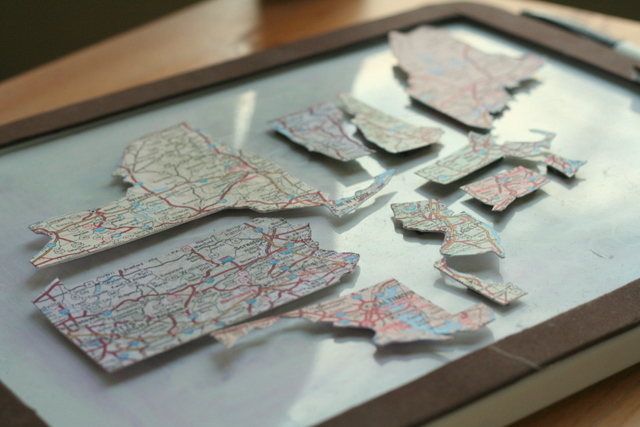 Once dry, cut out the states along the state lines. I chose to ignore the city names that were overlapping the states, and just cut right through them. I also cut off the water so the state shapes are distinctive. If you are having difficulty being as precise as you would like with the borders, you can use an X-acto knife to get the little details. 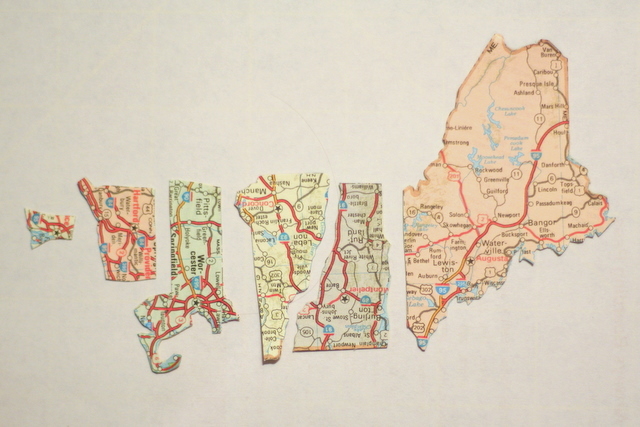 Cut a bit of magnet strip that will fit within the state shape (Rhode Island is a fun one). These magnets are light, so you don’t need much – 1/2″ to 1″ long should hold most states. Glue or tape the magnet to back of the state shape. Test yourself on your geography knowledge! For the bigger states (as they say, everything is bigger in Texas), you can use a piece of posterboard or part of a cereal box. I was making these magnets with what I had on hand (cost = $0! 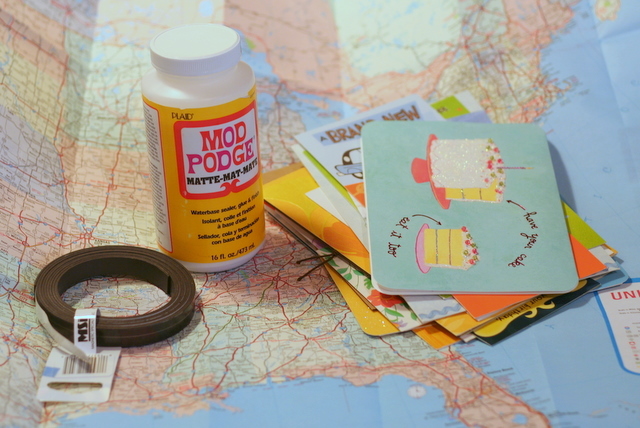 ), but if you have magnet sheets, you could Mod Podge the map directly to the sheets, and cut out the shapes from there. If you have access to a laminator, that would add some durability to these, too. If you give this a try, leave a comment below and let me know how it goes! This entry was posted in Etc, home dec, tutorial. Bookmark the permalink. In step 4 of the pattern here (http://www.lacasadecrafts.com/2012/09/how-to-crochet-a-saguaro-cactus/), you use a combination of single crochet, double crochet, and slipstitches to create the bend in the arm. If that doesn’t give you enough bend, you can insert a pipe cleaner into the arm before you attach it to the body, and use that to bend it.